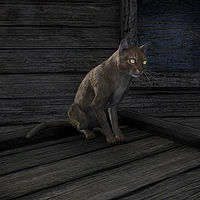 Cats are aesthetic passive creatures often found in settlements. They come in several colors, such as brown, gray tabby, and seal point. As they are aesthetic creatures, they cannot be attacked, and do not take damage. Fighting Back: Find the location of a secret meeting place. Nothing to Sneeze At: Help a Telvanni herbalist save her business from a Mages Guild upstart. This page was last modified on 7 July 2018, at 07:52.